This 4 bedroom, 2.5 bath home offers great curb appeal with mature, low maintenance landscaping, irrigation system, and large covered front porch. 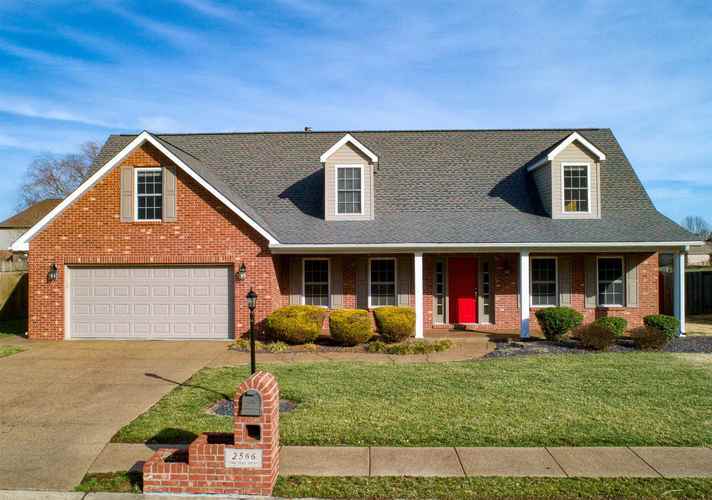 This move-in ready Newburgh home is situated in a desirable subdivision with feeds to great schools. The foyer with staircase opens to the living room with French doors and crown molding and to the large dining room making this floor plan perfect for entertaining family and friends. The kitchen will delight any cook and offers an abundance of cabinetry, pantry, all appliances included, breakfast bar, and a large dining area with French doors leading to the patio overlooking the large privacy fenced back yard. The family room with fireplace and custom window treatments is open to the kitchen. The main level also offers a guest bath and a large laundry with sink, cabinetry, and shelving. The second level offers a large master bedroom with offset and a master bath with separate vanities, corner garden tub, separate shower, and a large walk-in closet with an abundance of shelving. There are three additional spacious bedrooms all with large walk-in closets and access to the full hall bath with tub/shower combo. The fourth bedroom is perfect for a bonus room if desired. Storage is not a problem with the oversized 2.5 car insulated garage with service door and offset for exercise, workshop, or hobbies in addition to the large storage shed with loft area. This immaculate home has been updated with new fixtures, updated a/c, water softener, newer roof, and much more! Conveniently located with easy access to shopping, dining, parks, and great schools this home ready for new owners!